Having kids is hard. Having a child out of wedlock and alone feels like a running a marathon with a boulder attached to your foot. I had gotten pregnant, after my marriage ended, by an ex-boyfriend/roommate in May of 2013. I was already a mother to a little boy with autism. My life was going in all directions, and the pregnancy forced me to pause. My family and I don't always see eye to eye; they were pretty much done with me, and with this new baby on the way. Bad circumstances with the father led me to move to Clearwater, FL, where my cousin's family lives. Needing more resources, I started searching for programs for pregnant women in the area. Online, I found several maternity homes: all of them run by private, church-funded ministries, with a Bible study component. I didn't find any state-funded ones. I'm not especially religious but I applied anyway and was accepted into a program called Manasota Solve, out of Bradenton, FL. There was just one opening in Solve's second house in Englewood, FL. It was exactly what I needed. The home was a safe place that catered to the needs of pregnant women. In addition to the Bible studies there were volunteers who came by to teach skills like sewing baby clothes. Lots of baby clothes and maternity items were always coming in. There was also mandatory counseling, provided by a counselor who came down from Sarasota. After my daughter Ivory was born, I moved to Sarasota feeling like a new person. Being around pro-life, pro-mother people gave me hope to be a mom again, but mostly they helped me to see myself as the new, strong woman I am! I would like to thank several people. First would be Rose Ann, the "house mom," for letting me know there was nothing wrong with my looks and that it was okay to be me. Second would be April, the volunteer photographer who takes pregnancy and baby pictures for the home residents. 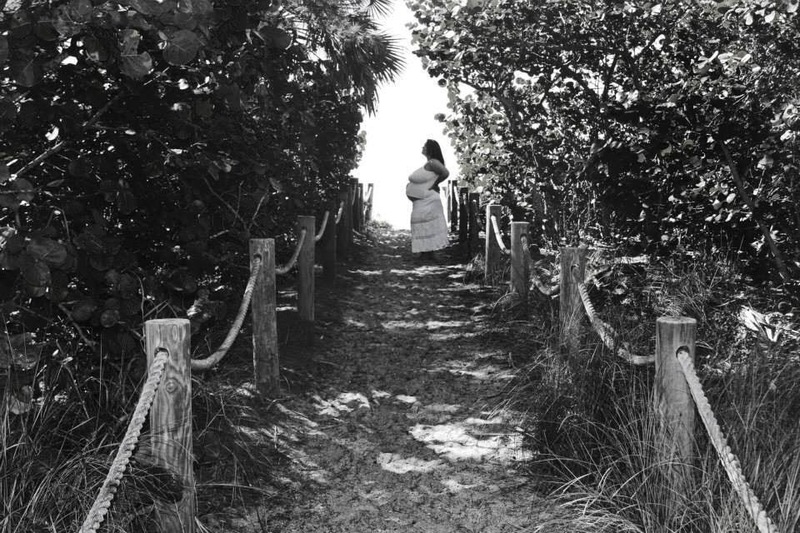 She took amazing photos of me and Ivory on the beach (see the photo at the top), and was there in the delivery room too. I cherish those pictures. Third, I thank "Mr. Bill," the counselor. The sessions I had with him went deep, resolving emotional issues that stretched back to my childhood. Because of him, I now feel that I can live my life like I did before my depression and bad marriage. Fourth, I thank "Miss Carol," a volunteer who often brought food and gifts for the residents. And finally I thank my pro-life friend Kelsey, who knew that my family wouldn't be at the hospital and drove to Sarasota the day after Ivory was born to spend time with us. My three months at the maternity home changed my life. I had no idea that pro-life maternity housing programs even existed, until I needed one. I used to think that pro-lifers just stood outside of abortion centers without really doing anything to address the situations young women are facing. I was wrong. There are people out there who see the root problems and actually do something about them. Those dedicated people have a powerful influence. As for the rest, it may seem like most people are too apathetic to do anything, but I think a lot of people would help when presented with the opportunity. Now that I've returned to the Roanoke, VA area, my dream is to see a program like Manasota Solve to help girls here. I agree with Purple Slurpy - it's absurd to call a prochoice maternity support house 'prolife'. I like the fact that Heather mentioned having a child with Autism. I have a form of Autism called Asperger Syndrome and am proud to find out there is someone similar to me. Is that what I said? I just said that as long as this support house doesn't force its inhabitants into Bible study, I think what it does is rather noble, and I wouldn't mind volunteering for something like this, provided they wouldn't mind an atheist, pro-life scientist as an SAT or GED coach. If it's not what you meant, I apologise for misinterpreting you! No prob, I've just googled other similar places, and many of them have mandatory Bible study. This place only "offers" Bible study, and also offers lots of useful life skill classes. If this is the case, I think this house is doing a good service regardless of its position on this issue. I'm sure they would love to have support from you! I work at a maternity home that, while founded in religious context, does not force religion upon anyone. The only mandatory things are that each women does her weekly chores, attends classes, saves her money, etc. I encourage you to reach out to these maternity homes you are interested in, they can certainly use everyone's help! I know for a fact they would. If you're dealing with the residents directly, you have to pass an FBI background check, as they are very protective of the residents. Also, some of the residents, from time to time, have triggers that prevent them from being around men, at all. It's nothing personal. On average, residents are there for about 4 months, plenty of time to learn, get certified, etc. Bible study is not mandatory, and neither it's church service, but they do provide transportation to church for women so inclined. Bible study classes are mandatory, as well as weekly attendance at a Christian (only) church. These are not noble places at all. That isn't what their application and stated rules say. Bible study and CHRISTIAN church services are stated as mandatory. Yes, Bible study and church attendance is mandatory. It's weird, isn't it? That only christian churches seem to be collecting enough money together to consistently do this. Why can't we (not you and I specifically, but fellow atheists) ? I've volunteered at a maternity home in my state, and while it got a lot of support from christian churches (a lot of them), they didn't care that I was an atheist when I was teaching the residents about Internet safety.